Visiting a bar or two is one of the best ways to see a city, but a late night can seriously deter early morning plans. That’s why it’s always important to be on the lookout for a hearty breakfast that can combat an evening of many drinks. Enter the breakfast burrito, which is substantial enough to keep us full until lunch, even if we’re walking miles in a new city. The breakfast burrito was invented, so the story goes, by a Santa Fe, New Mexico restaurant called Tia Sophia’s in 1975. Or at least it was the first place to specifically call it a “breakfast burrito” on the menu. A lot of things have changed since then, including the fact that you can find an at least halfway decent breakfast burrito in any mid-size town. But halfway decent doesn’t always cut it. If you’re traveling in the cities listed below, make it a point to eat a breakfast burrito. These are the best breakfast burritos in the country, from California to New York and everywhere in between. Always respect the original. Not much has changed about the family-owned classic diner, and it still serves the same belly warming northern New Mexico fare as it did when it first opened. 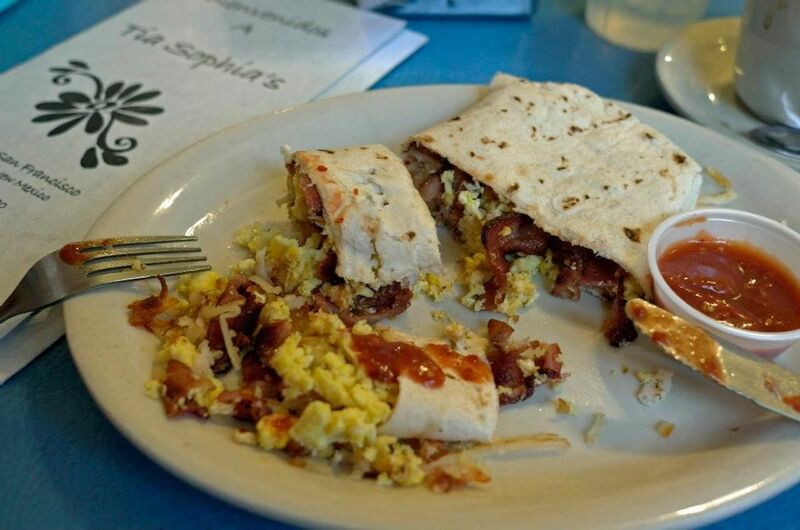 Eggs are optional in Tia Sophia’s breakfast burrito, but all burritos come stuffed with hash browns and your choice of meaty goodness. Ham, sausage, and bacon are all options — as well as beans for our veggie friends — but order it with fried bologna if you really want to eat like a local. Top it off with Tia Sophia’s red or green chili if you woke up with a big appetite. Barbecue aficionados might be familiar with Scott’s Kitchen, which competition barbecue man Scott Umscheid opened in 2017. While you’re sure to find meaty favorites like ribs, pulled pork, and brisket — along with sides such as BBQ beans and jalapeño apple slaw — Scott’s Kitchen is known for its large menu of tacos and burritos. The restaurant is close to the Kansas City airport, so stop in for a breakfast burrito when you land or before taking off. While you can’t go wrong with any meat to accompany the scrambled eggs, potatoes, and homemade salsa, we suggest trying the burnt ends or housemade chipotle ghost pepper sausage if you can take the heat. Foster Sundry is a Bushwick, Brooklyn shop that has everything you need to make an excellent meal at home, including a butcher, cheese counter, and a curated selection of gourmet goods and craft beer. 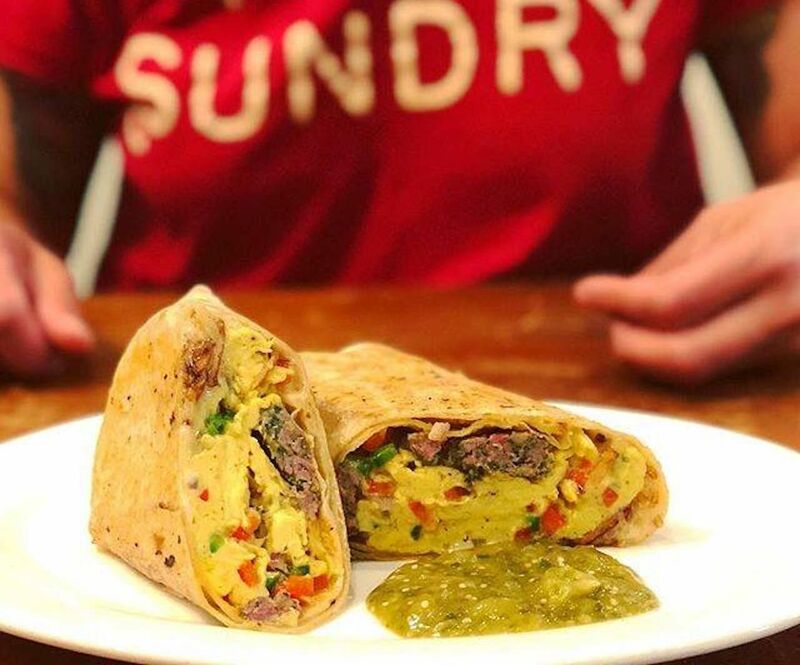 But what you really need to order at Foster Sundry is the breakfast burrito. It’s packed with cheddar, housemade chorizo, scrambled pastured eggs, pepper, onions, jalapeños, and crispy fried potatoes. One of these bad boys will fuel you up for a full day of exploring New York City. Kono’s started out with the Haleiwa location in 2002, and has since grown to three locations across Hawaii. The mini-chain is famous for its 12-hour, slow-roasted Kalua pork that’s served morning, noon, and night. 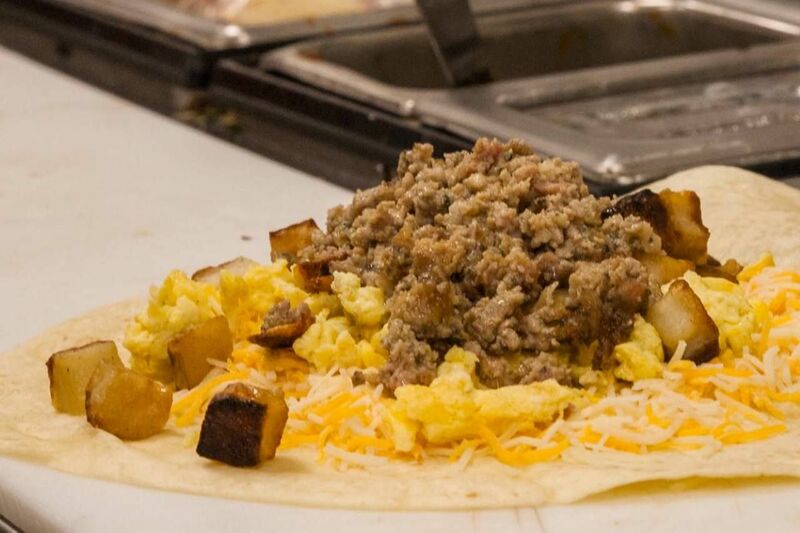 Kono’s is also known for the Breakfast Bombers, aka burritos, that are stuffed with roasted pork, bacon, Portuguese sausage, potatoes, eggs, and cheese. Each Kono’s location opens at 7:00 AM, so you can stop in for a Breakfast Bomber before a long day of catching waves, lounging on Hawaii’s best beaches, or hiking the island’s many beautiful trails. Ask a Los Angeles local who makes their favorite breakfast burrito in the city, and they’ll likely point you in the direction of Cofax. This Fairfax coffee shop opened in 2014 and quickly realized it needed to serve breakfast. And so the morning burrito was born. Each one is stuffed with slow-smoked potatoes from Cofax’s sister restaurant, Bludso’s Bar & Que, and you can choose to add things like veggies, pastrami hot links, and avocado to the mix. 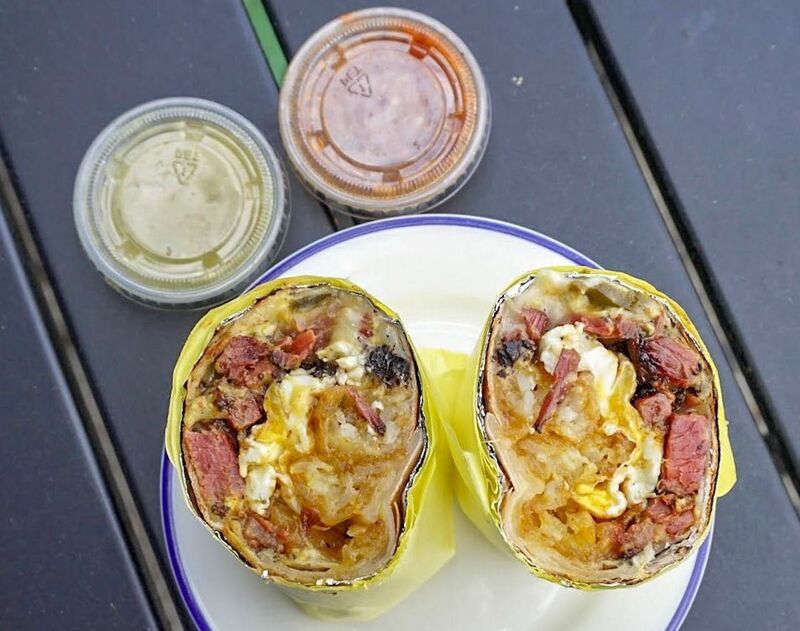 Pair it with a freshly brewed Stumptown coffee and a big pair of sunglasses and these breakfast burritos will help you swiftly recover from any hangover. Denver has a lot of solid breakfast burritos, but the best in Colorado can be found in nearby Golden. 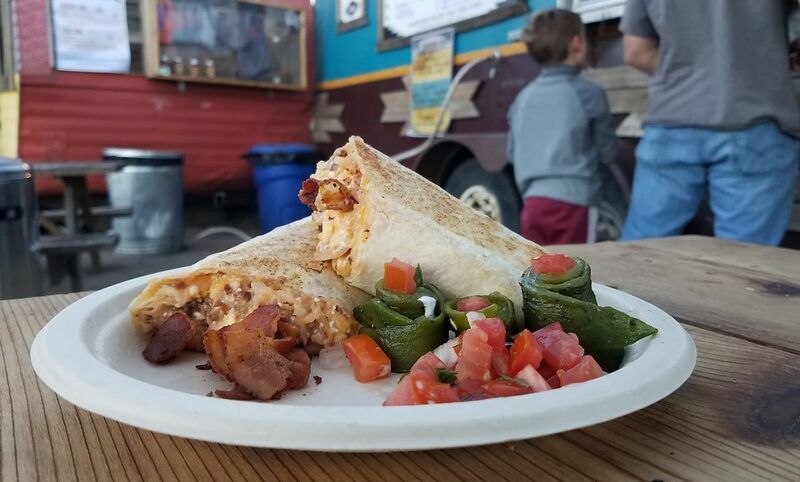 Although Bonfire Burritos has been around for quite some time, a group of friends who grew up eating at the food truck decided to buy it in 2013 when the original owner retired. They spent time mastering the recipes, and people still flock there for their hearty, green chile-smothered burritos. 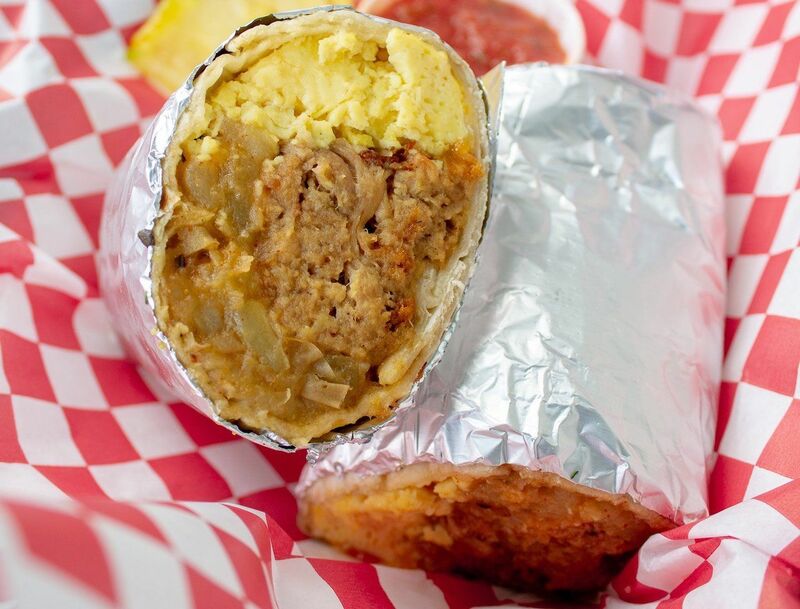 All of the breakfast burritos are filled with rice, beans, and green chile, and you can choose from a variety of styles like the Javelina, which is stuffed with pork, pineapple, cotija cheese, diced jalapeño, and jalapeño-pineapple crema. Visit for a hearty breakfast before hitting Colorado’s best ski spots.